Comfort, convenience and thoughtful ergonomics come together in the versatile Movario 5 hand shower. 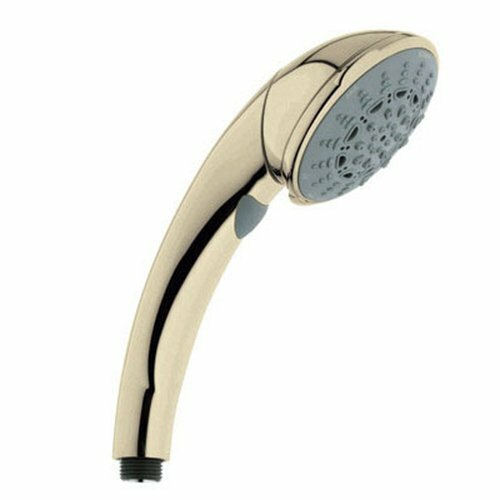 Though compact with a 4-in.-diameter spray face, it features a Rotahead System that enables it to function as a showerhead or body spray when mounted on a shower arm. Users adjust the spray angle and position to one of eight preset positions. Moreoever, the hand shower comes with five spray modes: Normal, an all-encompassing spray pattern; Jet, which delivers a focused and circular burst of water; Rain, a soft and wide spray pattern; the vigorous Massage; and water-efficient Champagne, which consists of large, air-enriched droplets. GROHE DreamSpray features advanced shower engines to deliver precise and consistent water distribution throughout any spray pattern for an unparalleled and custom showering experience distributes water evenly to each spray nozzle and GROHE SpeedClean anti-limescale system makes cleaning them a breeze. The Movario Five has a 2.5-gpm flow and comes in sparkling GROHE StarLight finish for scratch and tarnish-resistant surfaces for a lifetime of beauty chrome, which will not scratch or tarnish. Comfort, convenience and thoughtful ergonomics come together in the versatile Movario 5 hand shower. 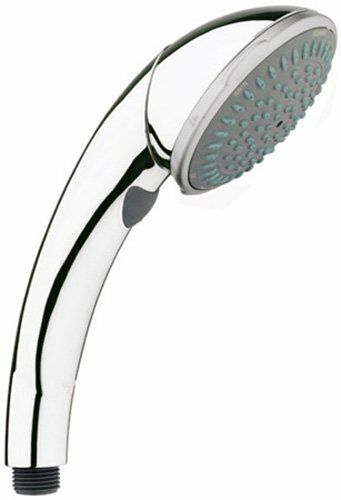 Though compact with a 4-in.-diameter spray face, it features a Rotahead System that enables it to function as a showerhead or body spray when mounted on a shower arm. Users adjust the spray angle and position to one of eight preset positions. Moreoever, the hand shower comes with five spray modes: Normal, an all-encompassing spray pattern; Jet, which delivers a focused and circular burst of water; Rain, a soft and wide spray pattern; the vigorous Massage; and water-efficient Champagne, which consists of large, air-enriched droplets. GROHE DreamSpray features advanced shower engines to deliver precise and consistent water distribution throughout any spray pattern for an unparalleled and custom showering experience distributes water evenly to each spray nozzle and GROHE SpeedClean anti-limescale system makes cleaning them a breeze. The Movario Five has a 2.5-gpm flow and comes in sparkling Brushed Nickel InfinityFinish, which will not scratch or tarnish. 28444R00 Finish: Polished Brass Features: -5 Spray patterns: normal, rain, massage, jet and champagne. -8-Position RotaHead system to adjust spray angle and position of the spray face. 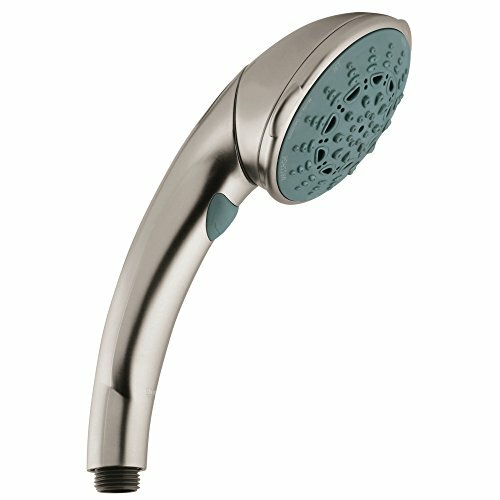 -RotaHead system allows hand shower to function as a shower head or a body spray. -SpeedClean anti-lime system. -ADA compliant. -Including five comforting spray modes. This hand shower is the perfect addition to any bathroom. Multiple shell handle construction prevents heat transfer. Shower Head Type: -Handheld shower head. Style: -Modern. Flow Rate: -2.5 Gallons Per Minute. Spray Pattern: -Jet/Massage/Rain. Dimensions: Shower Head: -Yes. Overall Product Weight: -0.794 lbs. 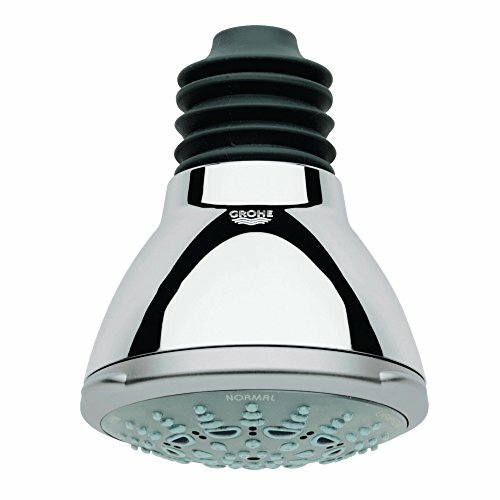 Compact in size yet powerful in performance, the Movario Five showerhead is not to be underestimated. Although its spray face measures a modest 3-15/16 in. in diameter, it comes equipped with five spray patterns, virtually guaranteeing a satisfying shower for every need. They include: Normal, an all-purpose spray that relaxes as well as refreshes; wide and soothing Rain; Jet, a revitalizing focused, circular burst of water; pulsating Massage; and Champagne, an effervescent setting that comprises air-infused droplets. Each is selected by rotating the spray face. The Movario Five incorporates GROHE DreamSpray features advanced shower engines to deliver precise and consistent water distribution throughout any spray pattern for an unparalleled and custom showering experience, which optimizes water distribution for uniform coverage, and GROHE SpeedClean minimizes maintenance by preventing limescale buildup. The Movario Five flows water at 2.5 gpm and is available in GROHE StarLight finish for scratch and tarnish-resistant surfaces for a lifetime of beauty chrome, Polished Nickel InfinityFinish, Brushed Nickel InfinityFinish and Oil Rubbed Bronze. Be it relaxation or rejuvenation, the Movario Five Shower Set has the perfect shower experience for any situation. At the heart of the shower set is the 2.5-gpm Movario 5 hand shower, which offers five spray patterns: Normal, an all-purpose, refreshing spray pattern; Jet, which delivers a focused, circular burst of water; soft and luxurious Rain; pulsating Massage; and Champagne, a water-efficient pattern featuring large, air-enriched droplets. All are enhanced with GROHE DreamSpray features advanced shower engines to deliver precise and consistent water distribution throughout any spray pattern for an unparalleled and custom showering experience technology, which optimizes water distribution to each individual spray nozzle, while GROHE SpeedClean protects them against limescale buildup. The shower set also includes a 36-in. 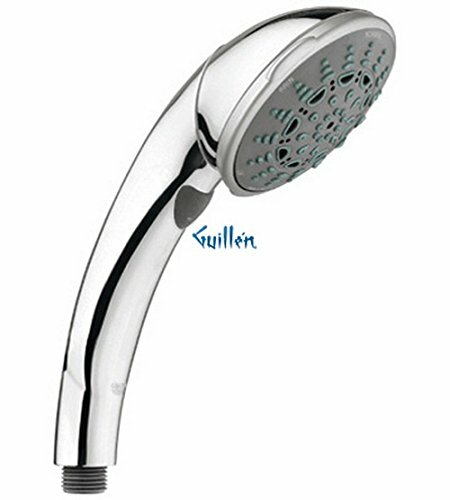 wall-mounted bracket and three height-adjustable shower holders, which enable the hand shower to function as a body spray or showerhead. Spray angle and position are easily adjustable, thanks to Movario 5’s Rotahead system. A tray for storing toiletries is also supplied. The Movario Five Shower Set is available in durable Brushed Nickel InfinityFinish. 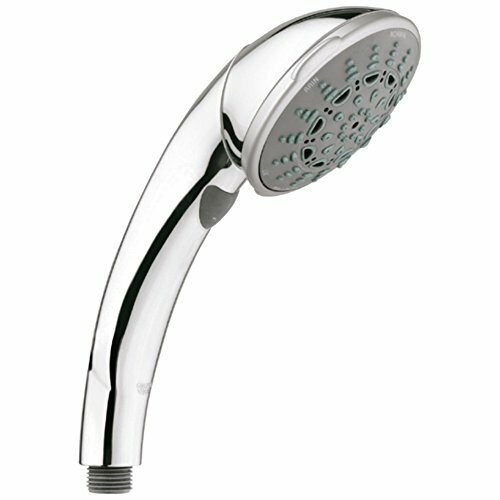 28521AV0 Finish: Satin Nickel Shown in Chrome Features: -Shower head.-5 spray patterns: normal, rain, massage, jet, and champagne.-Integrated shower arm and shower head.-1/2'' NP female threads.-SpeedClean anti-lime system.-Adjustable angles of inclination for shower or tub.-Flow rate: 2.5 gpm at 80 psi (9.5 lpm). Options: -Available in several finishes. Collection: -Movario collection. 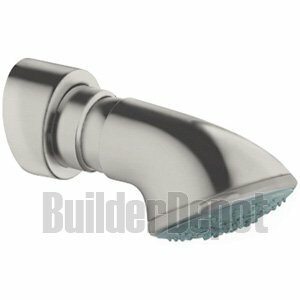 28441ENE Finish: Infinity Brushed Nickel Features: -Normal jet and rain spray patterns. -8 Position RotaHead system. -Adjust spray angle and position of the spray face. 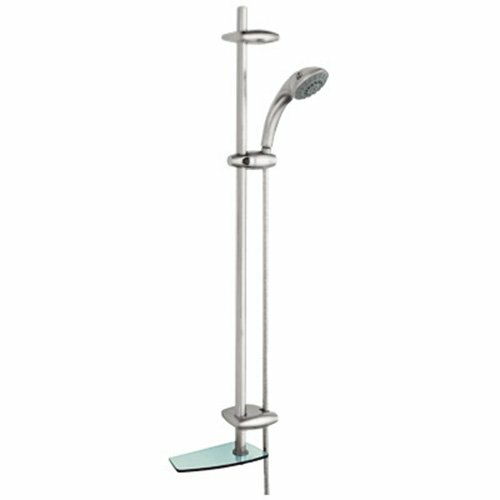 -RotaHead System allows hand shower to function as a shower head or a body spray. -DreamSpray technology. -Anti lime system. Shower Head Type: -Handheld shower head. Style: -Contemporary. Flow Rate: -2.5 Gallons Per Minute. Spray Pattern: -Jet/Rain. Dimensions: Shower Head: -Yes. Overall Product Weight: -1 lbs. Looking for more Movario Handheld Showerhead similar ideas? Try to explore these searches: Weather Wicker Storage, Floral Rare Editions, and Equipment Stand Stainless Steel Legs.